There are rooms for rent in this 180 m², 4-bedroom apartment shared with the live-in landlady and her two daughters in Bernabéu. The apartment has a sunny balcony, a spacious living area and a dining room. This apartment also includes 2 bathrooms and an equipped kitchen with independent refrigerator, which has excellent natural light. 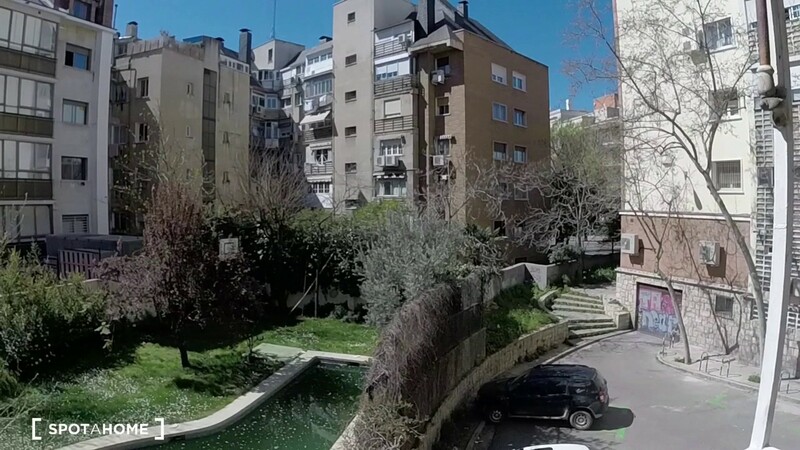 This apartment is on Calle Jiloca in Bernabéu, an area which is home to attractions like the Four Towers of Madrid and surrounded by scenic parks like the Parque de Berlin. This area is surrounded by multiple restaurants and conveniently close to several grocery stores. There are 2 large dining tables, ideal for entertaining. One of the bathrooms is polished in a stunning green hue. You will have your own independent refrigerator! There is plenty of storage space throughout the apartment. Madrid-Barajas Airport is easily accessible on public transport. There is an option for half-board (media pensión), the cost of which is to be discussed with the landlady. Concha Espina metro station is a 5-minute walk away and serves line 9. You will be living with the landlady who is in her 50s and her 22 and 24 year old daughters. She does not speak English but she is friendly. The landlady also has a dog which lives in the apartment during the weekends.